My morning coffee—and many other treats—will never be the same, thanks to the vanilla sugar we recently made. Recycling the beans used for our delicious homemade vanilla extract, we made two batches of the sweetener. One was made with standard granulated sugar and the other was made with raw sugar. I wouldn’t say that one is better than the other, but I expect each one to carve out its own place in our kitchen. So far, the raw version has worked well to top muffins and french toast, while the granulated sugar works best when incorporated into baking recipes (like these brownies). Both give coffee and iced coffee a nice hint of flavor and I can’t wait to jazz up my summertime sweet tea (stay tuned) with a few spoonfuls. 1. Pour sugar into the glass jar. 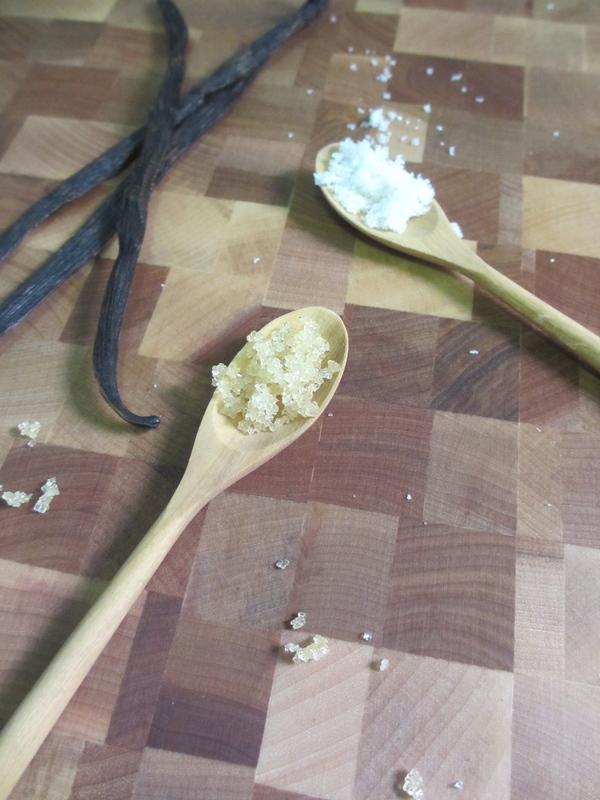 Trim the vanilla beans down to 2- to 3-inch segments so they’ll be completely covered by sugar once placed in the jar. Add to the jar, secure the lid tightly and shake until well combined. Set aside and shake the jar every few days. The flavor should develop within a week and will get stronger and stronger every day. I was happiest with ours after two weeks. SWWU Tip 1: If you’ll be using previously used beans for this, be sure to let them sit out on the counter for a few hours to dry out. They shouldn’t be wet when placed in the sugar. SWWU Tip 2: Using fresh pods for this? Split each down the middle, remove the seeds and add everything to the jar. Mix to combine. SWWU Tip 3: This can be a never-ending jar of sweetener. As the level gets lower, just add more sugar to the jar. If you notice the flavor isn’t as strong, swap in some new vanilla beans.